From birth my sweet baby has hated water. I will not lie to you when I was younger I also dreaded the water as well. I would convince my mother to take me to the pool for swim lessons and then cry once there. She would get so frustrated because learning to swim is vital lesson we should all learn! While pregnant, I remember reading all sort of baby books in preparations of my little bundle. In one of them I read: the earlier a child is introduced to water the more likely they will feel comfortable in and out of the water. I "hear" as they grow and get more comfortable with the water they will learn to enjoy it more...let's hope that is sooner rather than later! 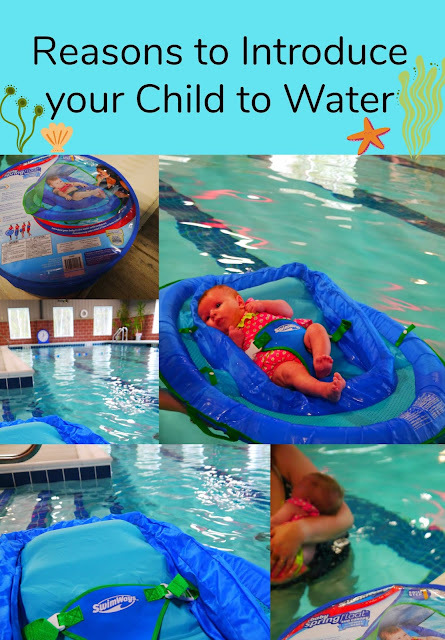 By using SwimWays Infant Baby Spring Float I created a positive water introduction experience. We all know children developmentally pick up skills better the younger they are (think how easy it is for kids to learn languages), so starting children young, and reinforcing the skills by continuing lessons or water education continually throughout childhood will create a much more confident and competent person in the unlikely event of a water accident. By using this device I hope to help to develop a love of water. 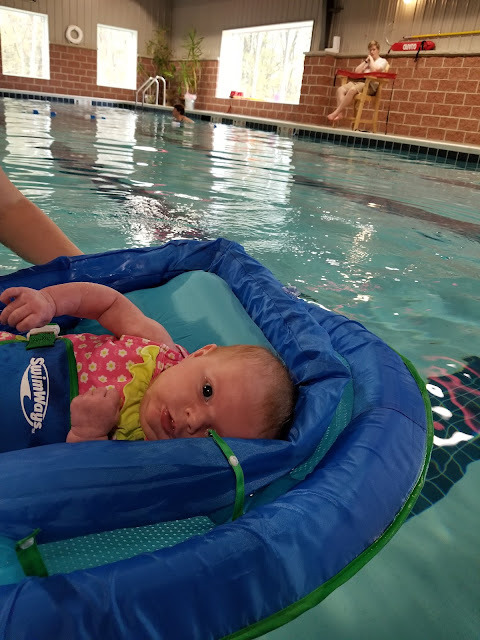 This SwimWays float has a soft seat that cradles your baby. It features a 3-point harness to keep them secure at all times. It also has dual inflation chambers, child safety valves, and a wide base with an inner spring around the outside edge of the float for stability. Trust me, when I say I was expecting a total melt down episode once we got it together and placed her in....nothing. Total radio silence and contentment (Yay). Just slide the flotation device out of the traveling bag and it easily folds open. Three areas need to be blown up and takes a couple of minutes to get inflated. By introducing your child to water early on it helps you not only bond but will teach them a life skill. While they float they are not actually in the water just comfortably resting on top. Remember teaching children skills is of course no substitute for supervision, which is one of the most important factors in preventing accidental drowning. By using the built-in handles included you can hold the baby float securely at all times! This SwimWays Infant Baby Spring Float also comes with a removable and adjustable sun canopy with UPF 50+ sun protection! We have not had the chance to use it since all it has done is rain lately. I can say not having to hold your baby in the actual water is such a blessing. Holding onto the flotation device at all times was much easier, we had no melt downs and more enjoyable for both of us. Did you introduce your child(ren) to water at an early age? What are your earliest pool memories (share them below)?? My earliest pool memories involve my dad swirling me around the water! I didn’t take my son to the pool unfortunately. However, we did take him to the beach and he loves it. Time for swimming lessons ! Oh my children loved the water! I think they were mermaids in another life. Haha. Now my grandchildren are the same. It is always difficult to get them out of the water when they have their bath. In a few months time, they will start swimming lessons.